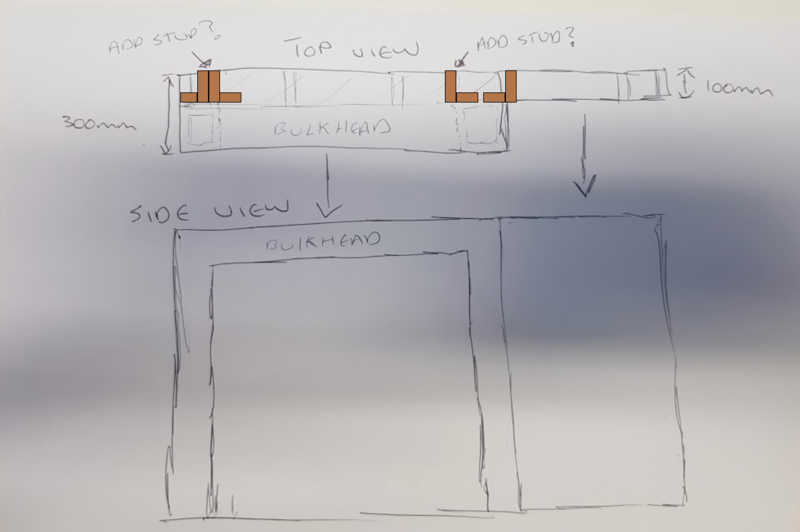 A: Build the full width of the framed wall 100mm deep (adding extra studs for attaching the bulkhead) and then build/attach the bulkhead separately? B: Incorporate the bulkhead into the framed wall design, building them as corners in the appropriate places? The bulkheads run from floor to ceiling and serve no purpose other than aesthetic appearance and housing a few spotlights, they will have no load applied to them (other than tiles), will they need to be attached to the ceiling/floor too? Normally I'd build the two separately, as in your first plan. However, I'd use pairs of studs in an L configuration as backing for the bulkhead. This provides interior drywall backing as well as a more convenient fastening scheme. Not the answer you're looking for? Browse other questions tagged drywall framing studs or ask your own question. How do I find studs when stud finders won't work? Can I build a staggered steel stud wall? Did I miss the stud when I drilled into the wall? Is there a limit to length of notch cut in “rear” stud in staggered stud wall?